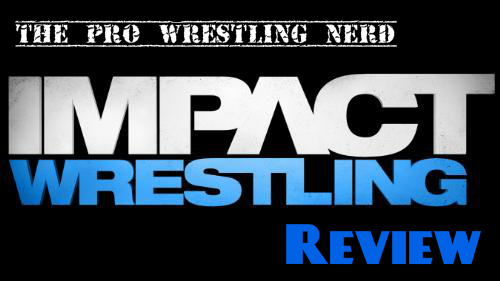 This week on IMPACT Wrestling, Bully Ray confronted his brother and former partner, Joey Ryan set his sights on some TNA gold, and Jeff Hardy made his first defense of the TNA World Heavyweight Title. Click “read more” for quick match results and a review of the show. Last week on IMPACT Wrestling, TNA announced that the TV Title situation would be settled on “Championship Thursday”. Although many speculated that Devon, who didn’t renew his contract and left the company, would return to lose the TV Title to someone, others figured that meant the belt was vacated and a new champion would be crowned. Well those who thought the latter can pat themselves on the back because in TNA’s new IMPACT Wrestling preview for Thursday’s show they officially addressed the situation and formerly vacated the belt. TNA also announced that for “Championship Thursday”, four competitors will plead their case as to why they deserve the TV Title to GM Hulk Hogan. Hogan will then decide which two will square off to decide the new champion. The four “contestants” are as follows: Samoa Joe, Magnus, Garett Bischoff, and Mr. Anderson. Although the belt has been wasted again and again, I still believe in the potential of the TV Title division and now they’ve got a chance to start anew with a strong champion. I’m hoping for either Joe or Magnus to get the belt so that can be added as another cog to their feud going into Bound For Glory but I’d just as easily accept Mr. Anderson becoming the champ. Anyone but Bischoff really; he’s getting better but he still has a long way to go before he’s ready for that sort of run (assuming TNA doesn’t drop the ball again with it). Either way, let’s at least hope they actually change the name on the physical belt this time around. No more of the “champ holds his hand over the “Legends” plate in pictures” thing, please. That’s bush league. Do you see any potential in a TNA TV Title division or am I just being (as the kids like to say) “cray”?